Who could ever forget the horror, the horror of witnessing studio mogul Jack Woltz waking up to discover the severed head of his prize race horse in bed with him? This image from The Godfather is just one of many that leaves an indelible imprint on the mind but memorable though it is, it can not overshadow the total effect of this masterpiece. Running at near three hours long the film maintains a mood of understated violence throughout. Even when it erupts with violence there’s a sense that things are under control, thanks largely to the presence of Marlon Brando as the eponymous Godfather, Don Vito Corleone, and Al Pacino as his youngest son Michael. 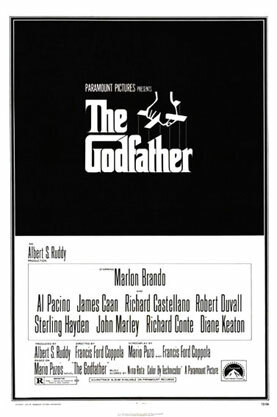 Both were the choice of director Francis Ford Coppola who, although relatively inexperienced at the time, was signed on to the project, according to Paramount chief Robert Evans, to give it that authentic ‘smell of spaghetti’. Playing twenty years his senior, Brando famously stuffed tissues in his cheeks for the screen test to make himself look “like a bulldog” then more sophisticated ‘dental plumpers’ in the actual production to become the aging mafia boss. His knock-out performance won him an Oscar for Best Actor in 1972 and Coppola too scooped a little gold statue for Best Screenplay Adaptation with Mario Puzo who wrote the original blockbuster novel. The film itself took out the Best Picture. With its’ dynamite extended family cast including James Caan, Robert Duvall, Diane Keaton and Coppola’s own sister, Talia Shire, The Godfather tells the story of one of five fictional mafia clans running New York in the late 1940s. When heroine dealers muscle in on the scene and threaten traditional criminal activities like gambling, the Corleone’s must decide whether to move with the times or bow out of the game, and that decision rests with the youngest and most reluctant member. It’s a wonderful tale of power, revenge, love and loyalty and it spawned no less than two sequels, further cementing its’ place in cinema history. The DVD box set was released in 2001 and now the trilogy is being released individually. It’s a hard offer to refuse.